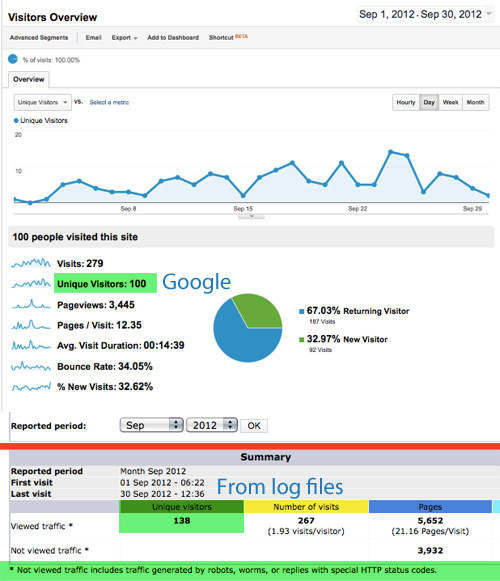 The main concern though is that Google gives me 100 unique visitors in a month vs. 138 from the web logs excluding bots�.what gives? I need to find a good way to omit my ip address or browser to be included in the stats so I stop messing up the pageviews vs. unique users. To continue our conversation on web statistics, I've analyzed the statistics on my web server from the log files, Google Analytics, and Webalizer installed on my shared Linux/Apache server. The Raw Access Log files on my server are set at a 24 hour stats run to save automatically. Default was to save only the current month's data. Past data was saved into the Webalizer database but log files older than 30 days were deleted. (I have stats all the way back to 2002 just not the actual log files) Might be good practice to save all log files. Also, analyzing the FTP log files may lead to exposing possible threats from the outside. Now the nitty gritty of web analeptics rhetoric. Let's start with the most "unique" number we'll be dealing with. "Unique Visitors" that is unique IP address on your site only cutting once. Even if they visit every page daily…uniquely one person. Google GA has the lowest numbers…Google weeds out bot requests, has longer sessions, and other factors account for GA's lower number. I take these to be more accurate. The clients want to how many eyeballs see their ad…or how many people read this article. Not how high a number i can come up with using all the access log file data regardless of intent by humans. The numbers are fairly consistent, but not matching from the different software. I find the spikes in unique visitors in certain years is due to updated content that the spiders can index. GoobleBOT, Yahoo SLURP, MSNbot, of all are coming to my site and indexing the content. If it doesn't change the bots have nothing to report. All this and I have not driven traffic to my site in any way. This was an online portfolio and resume for me. Since I have added a tag cloud and a a few web and graphic design tutorials the traffic is increasing. People are searching for easy solutions for web development. Hopefully I can take this project to the next level and get advertisers when a following is established. Our numbers will be much higher…we have opt-in lists we continuously drive traffic to the website with. We want to count those people, not the bots indexing the site.